The curry spices and ginger combine with parsnips and apples into beautiful soup – both in colour and in taste. 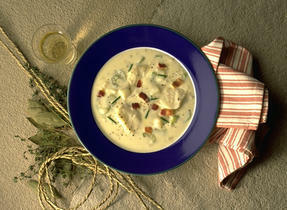 The milk smoothes out the spices and lends a creamy texture, and the lime and cilantro add a fresh touch. Serve this as a starter to a curry meal, or with a chicken sandwich for lunch. In a pot, melt butter over medium heat. Sauté onion for 3 minutes or until starting to soften. Add ginger and curry powder; sauté for about 2 minutes or until onions are softened. Stir in parsnips, apples, potato, 1/4 tsp (1 mL) each salt and pepper, and broth. Cover and bring to a boil over high heat. 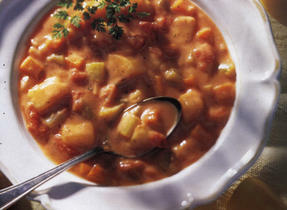 Reduce heat to medium-low, cover and boil gently, stirring occasionally, for 10 minutes or until vegetables are soft. Whisk flour into milk and stir into pot. Use an immersion blender in the pot or transfer soup to a blender or food processor, in batches, and purée until smooth. Return to pot, if necessary. Heat over medium heat, stirring often, for about 5 minutes or until slightly thickened. Drizzle in 2 tbsp (30 mL) lime or lemon juice while stirring. Season with more lime juice, if desired, and up to 1/4 tsp (1 mL) more salt and pepper to taste. Ladle soup into warmed bowls and sprinkle with cilantro and almonds. When chopping the parsnips, trim out any tough, woody cores and discard. They don’t become tender with cooking and will make for a stringy texture in the soup. 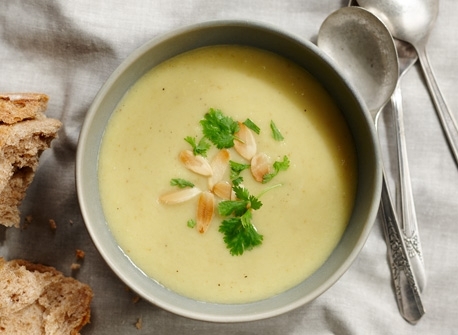 A tart apple that keeps its flavour when cooked is best for this soup. Try McIntosh, Empire, Crispin or Granny Smith. Baking potatoes (such as oblong russet potatoes) or all-purpose potatoes work best in puréed soups because they thicken the soup without adding a gluey texture. Avoid round, waxy or new potatoes for the best texture. To toast almonds, toast in a dry skillet over medium heat, stirring constantly for about 4 minutes or until golden and fragrant. Immediately transfer to a bowl and let cool.